I reviewed Krishna Ink’s Jungle Volcano a few weeks ago (link here), and I gave a little background on the ink and its maker in that review. So, if you’ve not heard of Krishna Ink before, go to that review first to read about the ink in general. This week, I’m reviewing Krishna Anokhi. If my Google searches are correct, the word “anokhi” means “unique.” It is also the name of an Indian clothing company that produces beautiful textiles in a variety of colors and patterns. 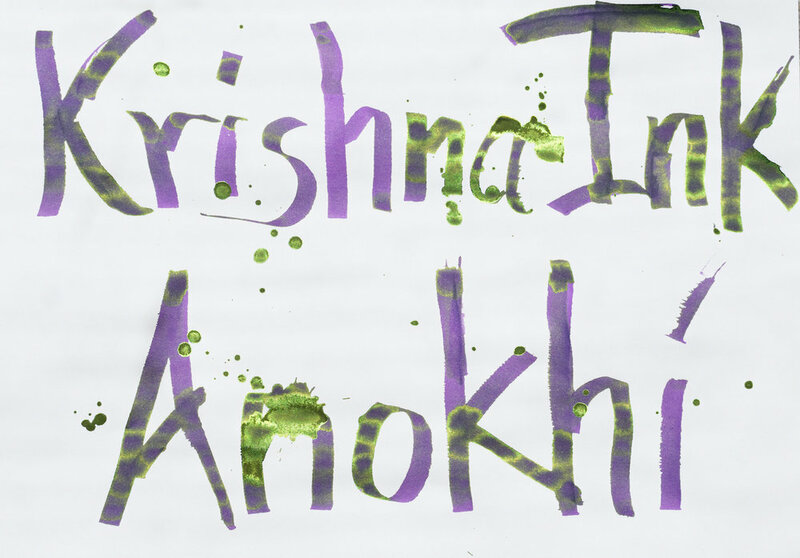 Krishna’s Anokhi ink is a purple ink with lime green sheen. I tested it using a Pilot Vanishing Point with a medium stub nib on Maruman Septcouleur white paper. The ink did not exhibit any sheen or shading in my tests on this paper. Rather, the ink presented as a pleasant medium purple ink with good saturation. It is not waterproof and is fairly wet. The chromatography test revealed only magenta and purple colors in the ink, so I’m not sure where the green sheen comes from. This ink is best appreciated on paper that reflects sheen (like Col-o-dex Rotary Cards [reviewed here]) or in wide nibs. You can see the vivid green in the following photos. 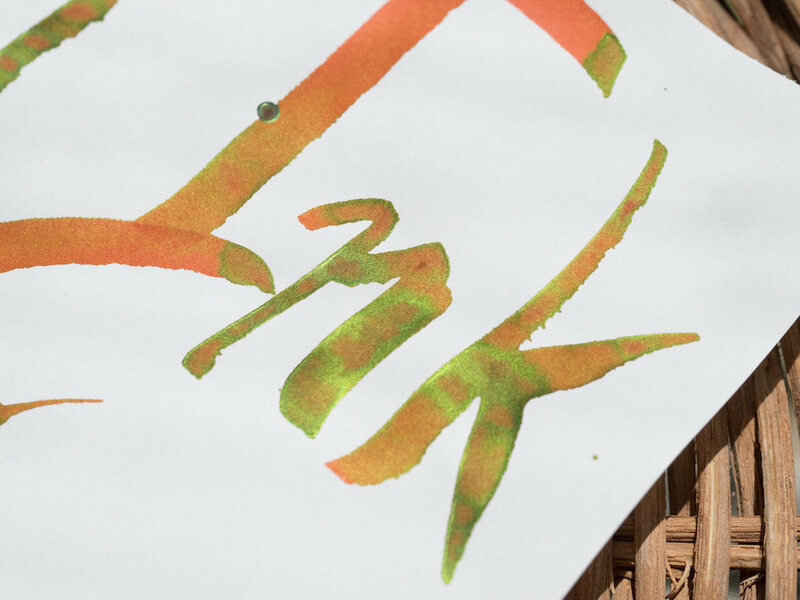 Anokhi is another wonderful color from Krishna Ink. I love the purple and green together because it’s such a unique combination—and that makes the name “Anokhi” a perfect name for this ink. You can purchase a 20ml bottle of Krishna Anokhi from Vanness Pens for $8.00. The bottles are very small, so if you want to use the ink with over-sized nibs, you’ll need to use a syringe or some other method to fill your pen. Posted on July 6, 2018 by Susan Pigott and filed under Krishna, Ink Reviews. 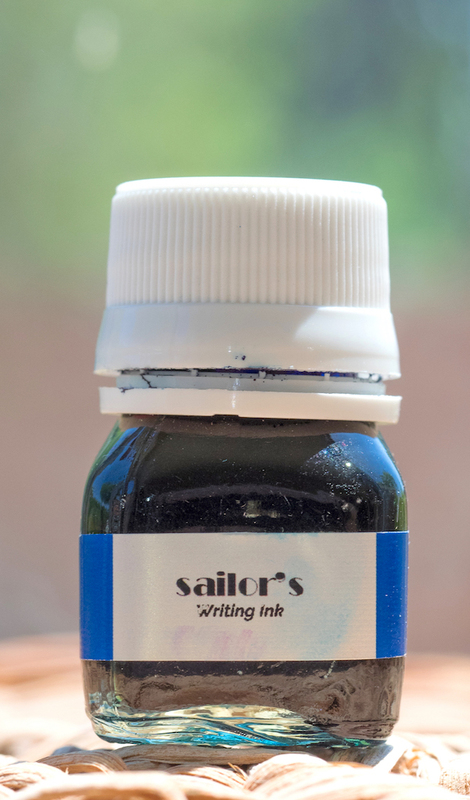 Krishna Ink Sailor’s is the third Krishna ink I’ve reviewed so far. If you want to read about the founder of Krishna Ink and a little background about the ink, please see the link here. Krishna Sailor’s is a dark turquoise ink with magenta sheen. I tested it using my new Sailor 1911 Large Stormy Sea with a medium italic nib (review here). The ink is a perfect match for this pen (if you like being matchy). The paper I use for my initial ink tests is Maruman Septcouleur white paper. This paper is good for showing off the true color of inks, but it does not reflect sheen (if any is present). My testing shows that the ink is highly saturated with good shading (in wider nibs). It is fairly wet and is not waterproof. Chromatography reveals that this ink is comprised entirely of blue shades, so the magenta sheen is a nice surprise. In order to get the best sheen, you need to use paper like Tomoe River Paper, MD Cotton Paper (reviewed here), or Col-o-dex Rotary Cards (reviewed here). The examples below were done on MD Cotton paper and a Col-o-dex card. 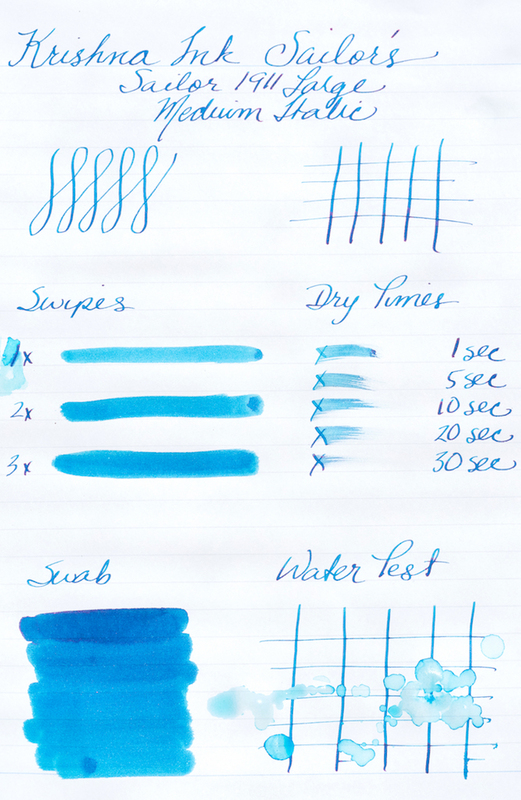 Sailor’s is an excellent deep turquoise color in and of itself. An added benefit (if you like sheen) is the beautiful magenta exhibited in wide nibs and sheen-enhancing paper. You can purchase a 20ml bottle of Krishna Sailor’s from Vanness Pens for $8.50. I love Krishna Ink so much that I will probably wind up buying the entire line at some point. I just wish they came in larger bottles. Posted on June 22, 2018 by Brad Dowdy and filed under Krishna, Ink Reviews. Krishna Ink is made in Palakkad, Kerala, India, and is the brainchild of a doctor and pen enthusiast named Sreekumar. He researched ink-making because he wanted to produce high quality fountain pen ink in India. You can read about his process here. Krishna inks are made to be safe (neutral) for all fountain pens and are water soluble (except for the Kot-massi series which are iron gall inks). Krishna inks are available to people outside of India through retailers like Vanness Pens. Krishna inks come packaged in a plain cardboard box. The bottles hold 20ml of ink and are made of glass. I saw photos of Krishna Jungle Volcano on Instagram and knew I had to get a bottle. I am thrilled with this ink. It’s a georgous orange ink that I find hard to categorize. Is it a terra cotta or a peach or a sunset? I don’t know because it looks different depending on the paper. 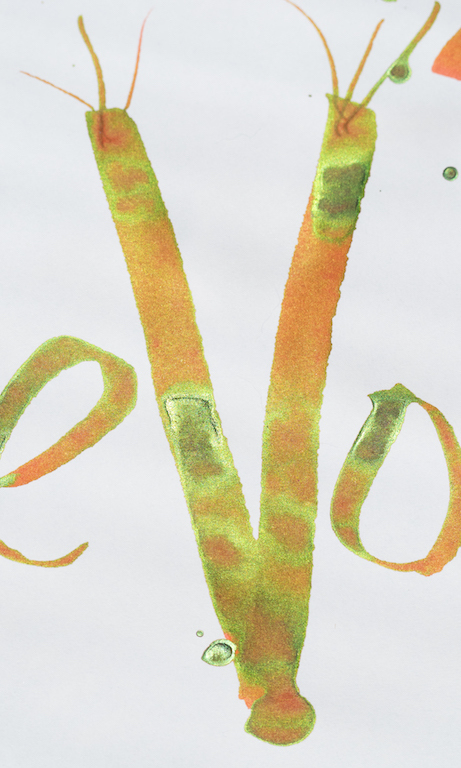 Jungle Volcano also has a crazy lime green sheen—it’s unlike any orange ink I’ve tried. I used a Maruman Septcouleur notebook for my initial ink testing because it contains smooth, pure white paper that shows off the ink’s true color(s). Jungle Volcano is a saturated orange with a definite pink tint on this paper. I did not observe much shading with my Franklin-Christoph medium italic nib, but the ink flowed well and was not too wet, drying completely after 30 seconds. The ink is definitely not waterproof, and it’s not meant to be. You can see the pink tint clearly in the water test. Although the green sheen did not show up much on the Maruman paper, it absolutely exploded on my MD Cotton Paper. Just look at those colors! Now you know why this ink is called Jungle Volcano. You can really see the green sheen on the Col-o-dex card (review coming soon), both in the swirls and the splats. The chromatography test I did demonstrates the complex colors in Jungle Volcano ink. The base color is a neon pink, with orange and green components. I am crazy about Krishna Jungle Volcano ink. I love how it’s a gorgeous, deep orange when you use a fine nib. But when you use a wide nib it erupts with green sheen. This stuff is amazing! It reminds me of Hawaii! It makes me want to eat bananas and sing Jungle Book songs! Seriously, though, I’ve had so much fun playing with this ink. You can purchase a 20 ml bottle of Krishna Jungle Volcano from Vanness Pens for $8.00. Be forewarned, the bottle is tiny, so you won’t be able to fill pens with super large nibs from it. You’ll need to use a syringe or, if you’re using a converter, just fill the converter itself rather than filling through the nib. Posted on June 1, 2018 by Susan Pigott and filed under Krishna, Ink Reviews.